Internationally known NY Times Bestselling author, speaker, and personal development guru Wayne Dyer has been an inspiration during my bulimia recovery journey. His words helped me in my darkest recovery moments go from struggling to surviving to now thriving. He taught me to access my higher self and to expand my consciousness using the wisdom of ancient philosophers and teachers. Wayne Dyer also taught by example that we can have whatever we want by learning the ways of the Universe. By reading Dyer’s many self-help books and listening to his personal growth CD’s I believe you, too, can grow your inner strength and find your way to full recovery from your eating disorder. Wayne Dyer wrote over 30 personal development books and created many inspirational audio programs and videos. He appeared on PBS TV programs and fundraising drives for public TV around the country. Born in Detroit he was raised in orphanages most of his adolescence. He often used lessons learned from his own life in his presentations. Dyer held a Doctorate in Educational Counseling from Wayne State University and was an associate professor at St. John’s University in New York. He retired from the university and launched a book tour after he published his first book Your Erogenous Zones – and never looked back. Wayne Dyer was perhaps one of the most easy to listen to and digest personal growth masters I’ve ever listened to. His self-help books are practical, straight-forward and use many examples of real life. Throughout my bulimia recovery I’ve listened to his CDs and read his books to learn how to use my mind to heal myself. As with previous personal development books Wayne Dyer has created he delivers powerful insights. As a recovered alcoholic turned philosopher he understood addiction and recovery. In his transformational book, he revealed how to change the self-defeating thought patterns you allow to prevent you from living at your highest levels of health, happiness and success. Dyer brought to light the fact that just because you know what to do, doing what you know can be challenging. Especially when it involves changing thinking habits you’ve had since childhood. Dyer teaches you how to challenge any excuse you may have by applying specific questions to break it apart and create a new perception about your thoughts. The old, habituated ways of thinking will dissolve when you come to realize why you’re hanging onto them – and how they’re actually not serving you. Ready to take responsibility for your life and say “excuses begone!”? Click here to order Wayne Dyer’s Excuses Begone! Wayne Dyer spent over a year researching, living and meditating on Lao-Tzu’s messages to create his personal development interpretation for today’s modern time. With his 81 essays on how to apply the wisdom of the Tao, Wayne Dyer created a modern version of a very spiritually deep teaching. The basis of the teachings provide a simple formula for living a spiritual, moral, and healthy life. I first listened to Wayne Dyer talk about this book on a PBS special many years ago. He talked in that workshop about how profound the changes were in his daily life as he would read a verse of the Tao and then eat, sleep and breath it during his life for a week. 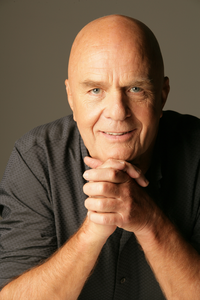 It seemed to me that after studying the Tao Wayne Dyer became more spiritually grounded and deep in his living of life. The original teachings are not easy (they are simple!) and Wayne Dyer does a wonderful job of making them understandable and something you can use in life. If you’re ready to release your food addiction by learning to change your thoughts, click here to order Dr. Wayne Dyer’s Change Your Thoughts, Change Your Life.